Not just long, beautifully long! My hair has never been this good since ages. Okay too good to be true but I admit the fact that even before I got pregnant, my hair has been so dull and unmanageable. When I was in high school, I remember that I've been a loyal Pantene user but when I got too many hair fall, I switch other brand. After using up my last sampleroom purchase, the Vidal Sassoon, I decided to try out on Palmolive again. Yes! Palmolive! Because I am aiming to have a long hair, but not just long, beautifully long, as what their ad says. I never thought that this will fit perfectly right for me. If you happen to read my recent post about the Human Nature shampoo you know that I got a patch on my head and after using the Palmolive shampoo the patches finally leave my scalp free! I was so happy! But I was a bit more happier after my husband told me one night that my hair is so soft and smells good! I also notice that my hair becomes smooth and I don't even have to apply conditioner right after. I choose this variant because I want to diminish the split ends on my dull hair. The shampoo didn't fail me. So now I consider myself as a Palmolive shampoo fan. Also, after using this shampoo, I got a dandruff free scalp which has been my problem ever since. I thought that I just didn't rinse my hair so well that it leaves flakes on my scalp when it dries up but I was wrong. 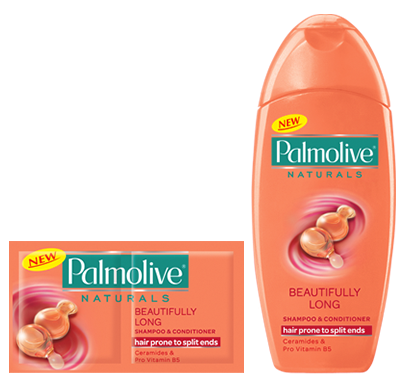 Good thing Palmolive not just gives me long, beautiful hair but also dandruff free. As you can see, the shampoo itself has conditioner already but I still preferred to use a conditioner after shampooing my hair whenever I go out. I am at home, then just plain shampoo. Of course some of you will use the same variant but I use another one. 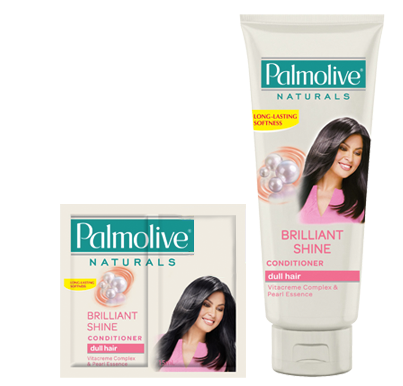 Instead, I opt to Palmolive Naturals Brilliant Shine Conditioner. Just because I wanted to add up some luster to my beautiful long hair. This prevents me to use other hair products like the hair polish and the likes. It also add up fragrant to my hair that lasts long. What I love about this conditioner is that it doesn't leave my hair greasy. Now that I found my match when it comes to shampoo, I could not ask for more. I can now have a beautifully long and brilliant shiny hair. Soft and smooth, manageable and smells good! How about you? What's your hair story?